Problems are mounting at Real Madrid and after an impressive display in defeat in the first leg, Ajax warrant some support at the Bernabeu on Tuesday, says Andy Schooler. "Real have no clean sheet in their last seven and just three in 19 matches. Ajax, meanwhile, managed to score away to both Bayern Munich and Benfica in this competition." There was a time - quite a significant period actually - when you could rely on a promising Arsenal season collapsing in late February/early March with the return of the Champions League. A last-16 exit would often come around an FA Cup defeat and a crucial Premier League loss as a potential Treble turned to dust in days. Is the same thing about to happen to Real Madrid's 2018/19 crop? 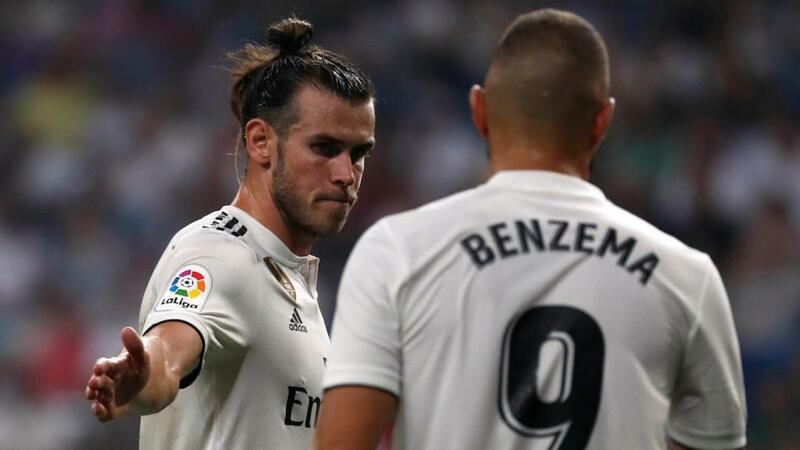 Last Wednesday they were crushed 3-0 at home by Barcelona to exit the Copa del Rey; on Saturday another home loss to their arch rivals, this time 1-0, effectively ended their hopes of winning La Liga. They may lead Ajax 2-1 after the first leg in Amsterdam, but the Dutch showed that night that have the players to inflict damage on Real, who have really hit the buffers since that clash three weeks ago. Santiago Solari's side went into that first leg in arguably their best form of the season but frankly they were fortunate to win and it was followed days later by a 2-1 home defeat to Girona. The subsequent Barca losses mean they've now lost three in a row in front of some angry fans at the Bernabeu. Gareth Bale was booed off again at the weekend, while the Madridistas are also none too happy with Toni Kroos right now. Marcelo, who has played a big part in Real's three successive Champions League triumphs, has fallen out of favour with the man who really matters, Solari, while that's also been the case with Isco, who bizarrely struggles to get a game. At least some bright moments have been provided by youngster Vinicius Junior, while Karim Benzema is finding the target regularly, even if some of his team-mates are not. However, overall it is not a happy ship right now and the loss of captain and defensive linchpin Sergio Ramos for this one will hardly help. At best they look vulnerable and when you also consider the way Ajax went at them in the first leg, there's no doubt Real still have plenty of work to do in this tie. In contrast to Real, Ajax's form has flipped since the first leg. They had started 2019 poorly but their display of attractive, incisive football appears to have renewed confidence - they had a goal ruled out by VAR and missed a host of other chances which could easily have seen them win on another day. Since that clash, they scored five in winning each of their two Eredivisie matches and also beat Feyenoord 3-0 to reach their domestic cup final. In an added bonus, the Dutch league allowed them to rearrange their weekend league game so they've had a full six days to prepare for this one. Former Southampton star Dusan Tadic has been a key member of a team which is challenging PSV for the Dutch title - he's now scored 12 times in his last 14 games and looks likely to lead the line here. Out wide, Hakim Ziyech, who scored in the first leg, also offers goal threat (he's bagged eight in his last nine in the Eredivisie). This is a team built very much in the traditions of the club and if any side is capable of keeping hold of the ball for long periods in the Bernabeu it is Ajax. Their chances of a fightback will depend largely on their own levels of belief - will they be prepared to attack Real from the off and risk conceding at the other end? Where they will be able to draw confidence from is some previous Real performances in this competition. Less than 12 months ago, Real returned to the Bernabeu with a 3-0 lead from the first leg only to fall 3-0 down to Juventus before scraping through via a controversial, late, Cristiano Ronaldo penalty. Then in 2015 there was Schalke's 4-3 win in this stadium, the Germans having lost the first leg 2-0. And sandwiched between those two games, in 2017, was Real's semi-final win over Atletico Madrid. On this occasion they won the first leg at home - 3-0 - but quickly found themselves 2-0 down in the return before again sneaking through. Many of the same players remain and such results suggest they have been guilty of some complacency having secured a strong first-leg advantage. There is no longer Ronaldo to turn to if things do take a turn for the worse and given the state of the Real camp right now, Ajax look worthy of support on some level. A basic play on them to win the game at [5.6] looks preferable to the [9.2] about them qualifying for the next round and that's an option worth taking. Real certainly look short enough at [1.68] given they are out of form and don't actually need to win. The draw is a [4.4] shot. As for the goal lines, the layers are expecting plenty of scoring. Given the need for a team to attack at some point or another, second games in two-legged ties always tend to have a short price about over 2.5 goals and that's again the case here. Over is at [1.43] and under [3.15]. However, only two of Ajax's six group-stage games featured over 2.5 - four of Real's did - and if you are going to be backing a short price like that I much prefer to head into the both-teams-to-score market where the 'yes' option looks banker material at [1.48]. Real have no clean sheet in their last seven and just three in 19 matches. Ajax, meanwhile, managed to score away to both Bayern Munich and Benfica in this competition, and have also struggled to keep clean sheets on their travels domestically - both teams have scored in four of their last five away Eredivisie games. Eleven of Ajax's 12 Champions league goals this season have come in the second half. I'll therefore take both teams to score in the second half and combine it with Dusan Tadic to score at anytime. He's in form and set to play centrally against a defence without its key man. Real Madrid have lost two of their last five home games in the Champions League (W2 D1), as many as in their previous 48 at the Bernabeu combined (W40 D6 L2).